Time for a trip to the Universal Orlando Resort. 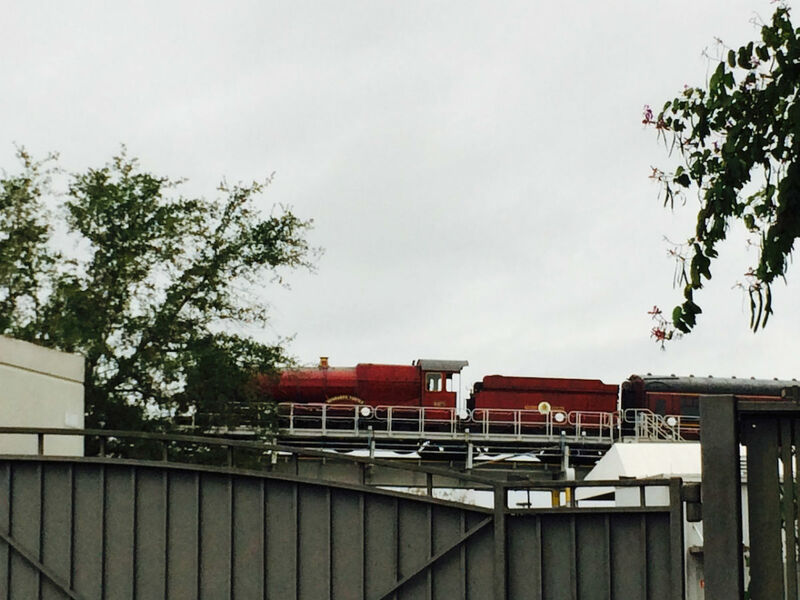 Seth Kubersky covered the Wizarding World of Harry Potter: Diagon Alley in his photo update earlier this week, so check out the first edition of his PotterWatch 2.0 for construction updates, rumors, and pictures. On the Universal website, Cabana Bay is having “preview pricing” that ends on June 14, 2014. That’s another red flag that they expect demand to go up in June. Here’s an example of what type of savings you can get for a Family Suite at Universal compared to Disney. I booked out a room from April 12-18 for 2 adults and 4 children at both Cabana Bay and Disney’s Art of Animation resort. The cheapest room at Cabana Bay was $232.00 a night, compared to the cheapest room at AoA at $498.76. After taxes, this particular week at Cabana Bay would cost a family $1572.06, while AoA would cost $2992.53. 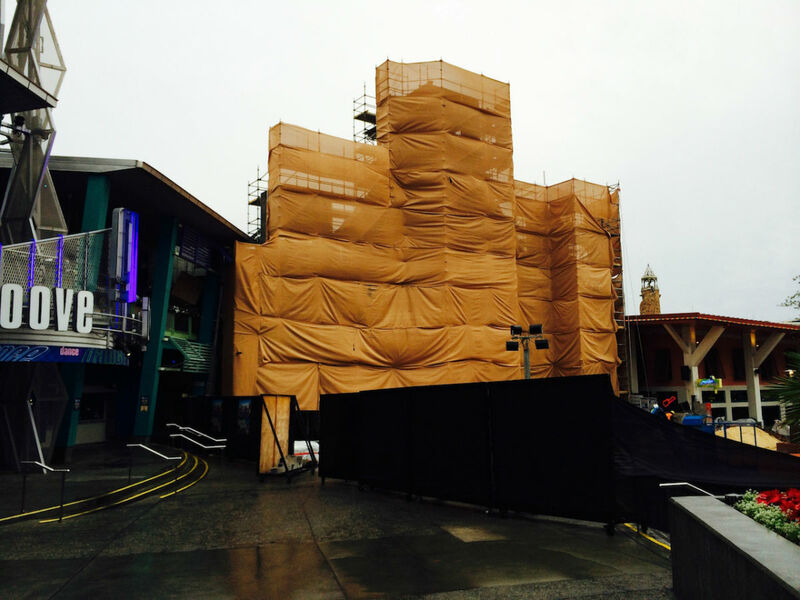 Speaking of construction, work in CityWalk continues for the venue which is replacing the former Latin Quarter. This new restaurant will be bordering Jimmy Buffet’s Margaritaville and looks to have a large facade. I’ve heard a couple different rumors of replacements and one of them – Don Quixote’s – could be using this large structure to support a windmill prop. 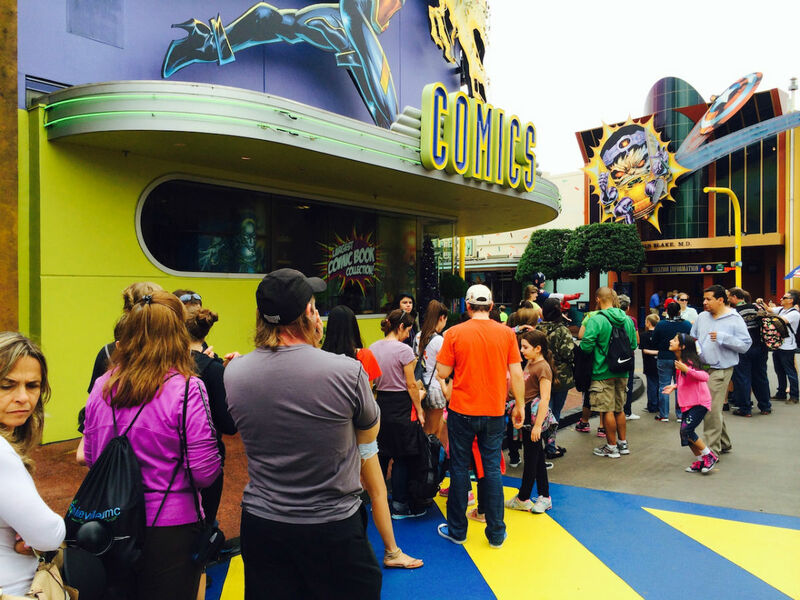 Let’s begin our journey into the parks with a stop at Universal Studios Florida. 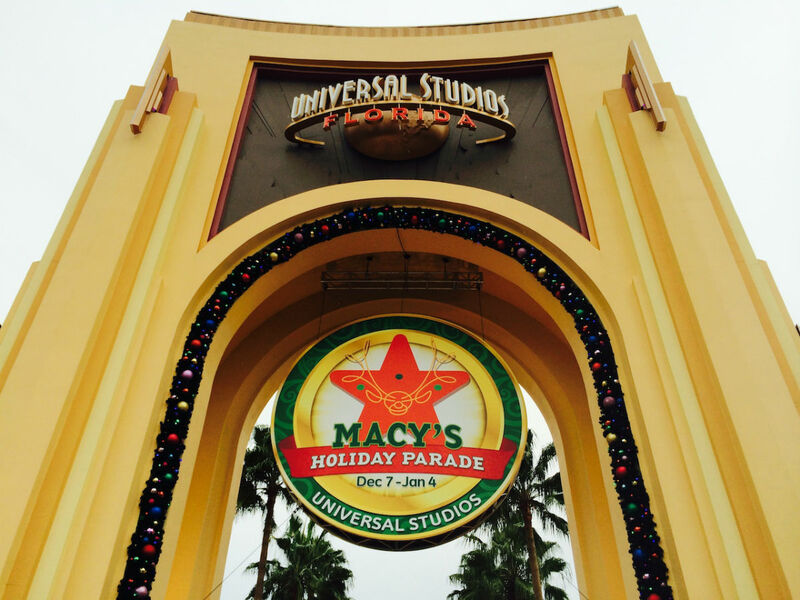 The iconic archway now has the Macy’s Holiday parade banner. 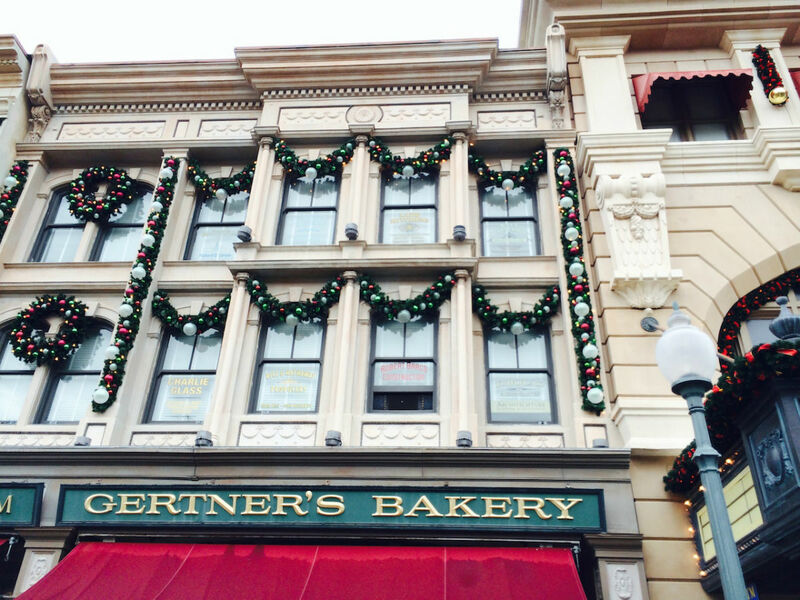 Considering how early Disney starts its Osborne Family Spectacle of Dancing Lights and Mickey’s Very Merry Christmas Party, it’s surprising that Universal waits until the first week of December to start the Macy’s parade at USF and Grinchmas at Islands of Adventure. Although with the amount of people who think Christmas music on the radio before Thanksgiving is too soon, maybe Universal’s delay is refreshing. 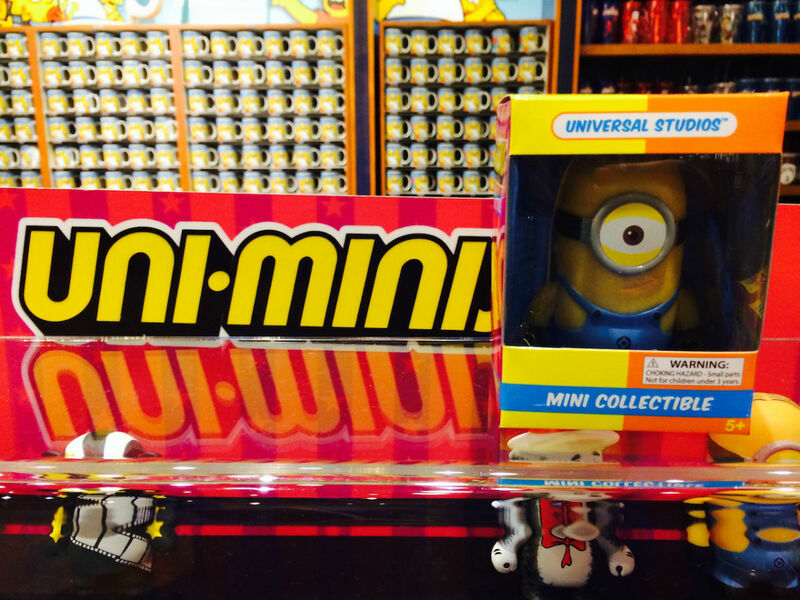 I found a nice surprise in the gift shops: Minion Uni-Minis are back in stocks. 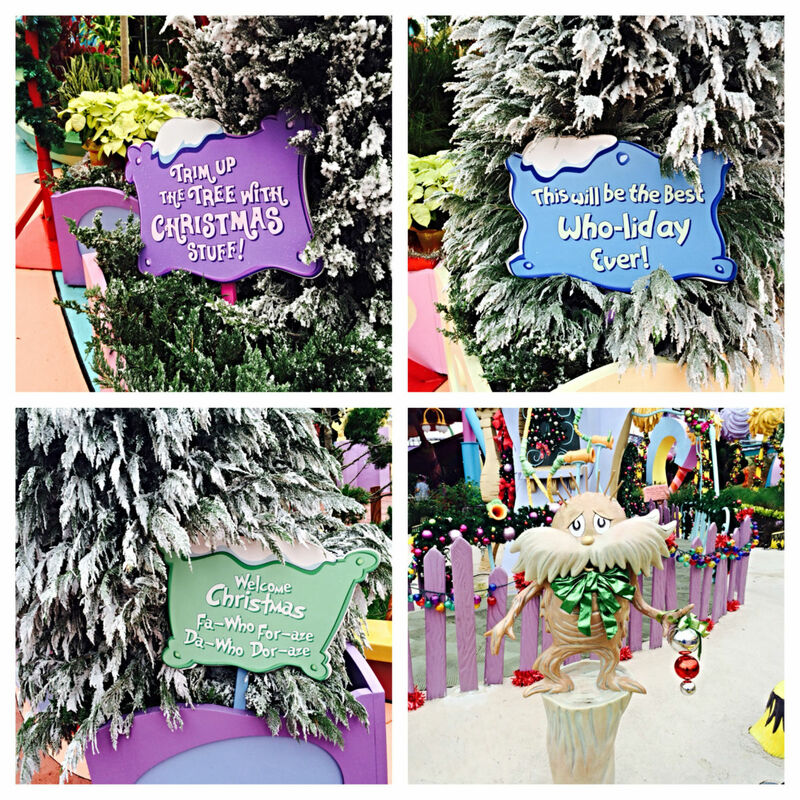 Hopefully for the holiday season we’ll see a Grinch show up soon. 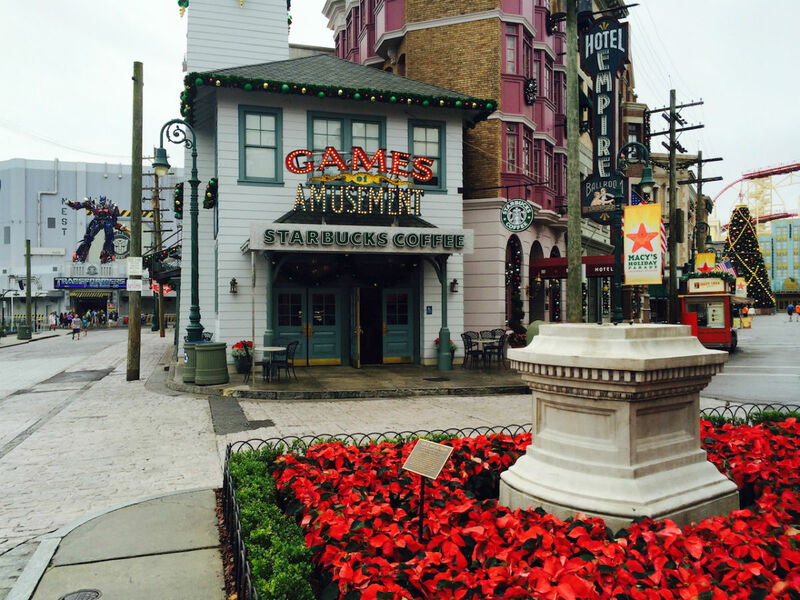 This merchandise location across from Despicable Me Minion Mayhem is not fully stocked with Christmas related items. All of Gramercy Park is decorated, and you can see the scale of the giant Christmas tree in front of the Macy’s facade in the background. 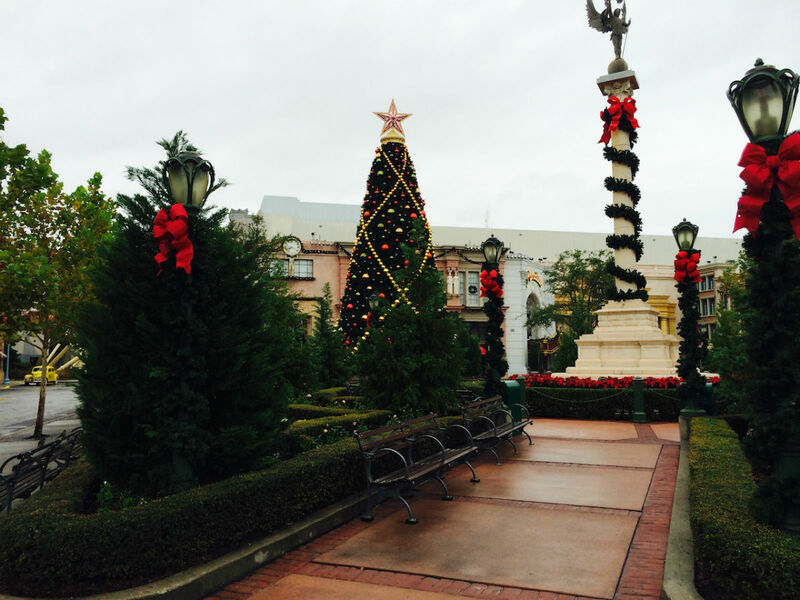 There are decorations throughout USF, on many of the buildings, light posts, and pretty much every place you can imagine (sorry, no Santa hat on Optimus Prime – I looked!). 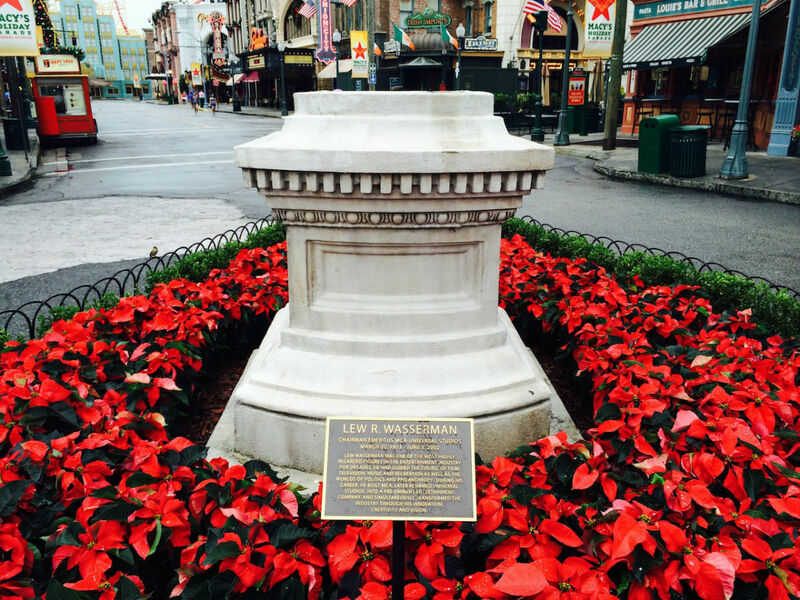 Because of the upcoming Macy’s Holiday Parade, the statue of Lew Wasserman has been removed. The statue is taken away to prevent any of the Macy’s balloons coming into contact with it. Here’s a closer look at the statue base – and plaque – that the Wasserman statue sits on top of. 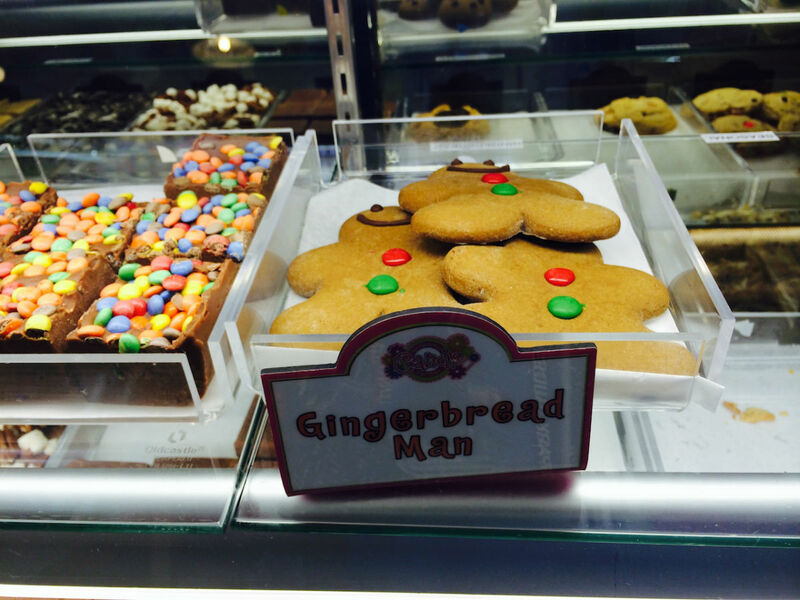 The San Francisco Pastry Co. and Studio Sweets shops have added some Christmas themed snacks to their inventory, including these gingerbread men. 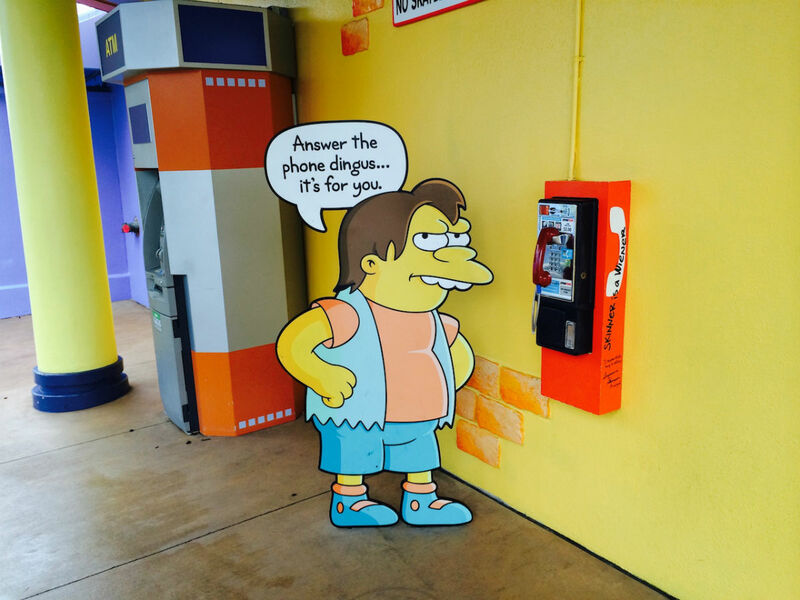 One of the things many people don’t realize at USF is that walking by this phone outside of the Kwik-E-Mart causes it to ring. When you pick up the receiver, you will hear one of Springfield’s citizens talking to you. I’ve heard several variations in the past, including Chief Wiggum putting out an A.P.B. on a donut, but this time I had the master phone prankster himself, Bart Simpson. Bart said, “This telephone is your god. Bow before me and deposit fifty cents!” The voice of Marge Simpson then came on and shouted, “Bart!” This was my favorite Simpsons phone experience by far and reminded me of the humor used in Kang & Kodos’ Hurl ‘n’ Twirl. If you hear this phone ringing by the Kwik-E-Mart, pick it up! Inside the Kwik-E-Mart there were some new plushes, including this great Dancing Homer one. 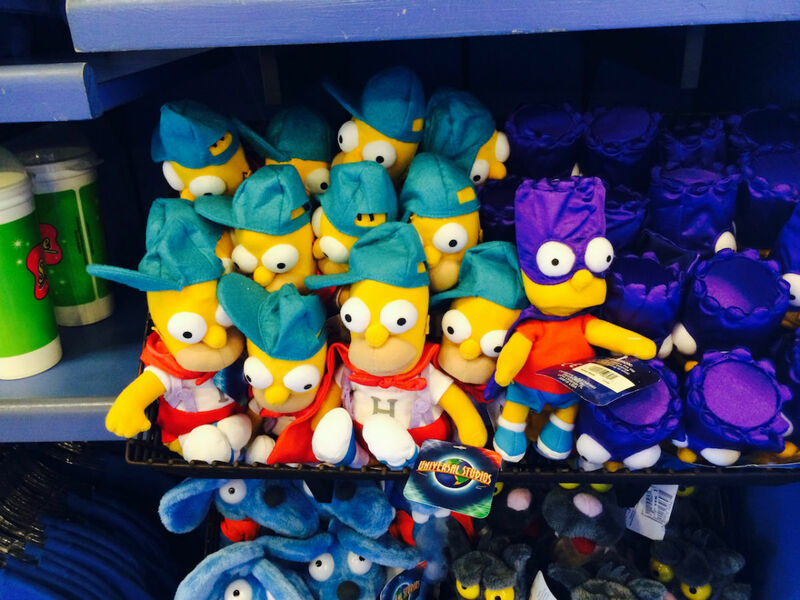 Bartman, Itchy, Scratchy, Santa’s Little Helper and the three eyed fish rounded out the small size plush. Some constructions walls were put up between Animal Actors on Location and Fast Food Boulevard. 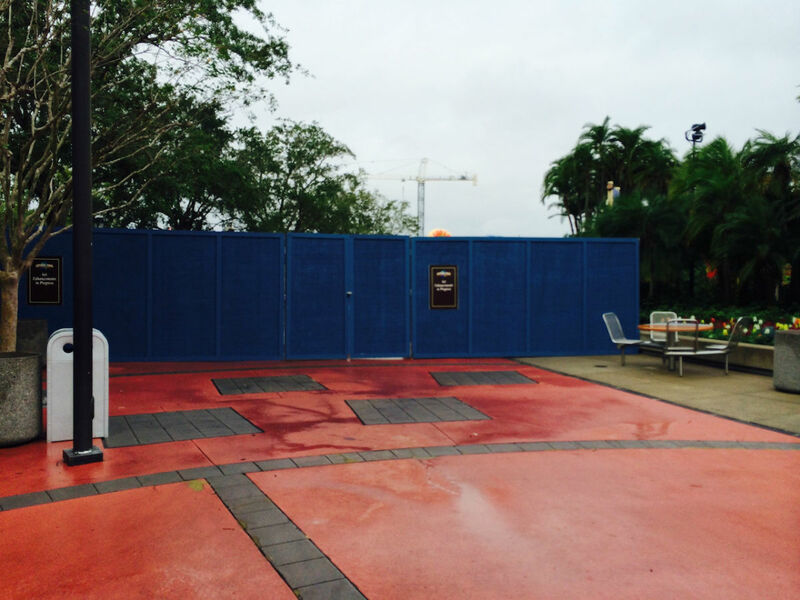 This construction looks to be removing some flag poles that were part of the old International Food and Film Festival dining location, along with improvement to the walkway (similar to the improvement made to the street next to Transformers: The Ride-3D earlier this year). The DeLorean from Back to the Future was also removed to give people more walking space while these walls are up. 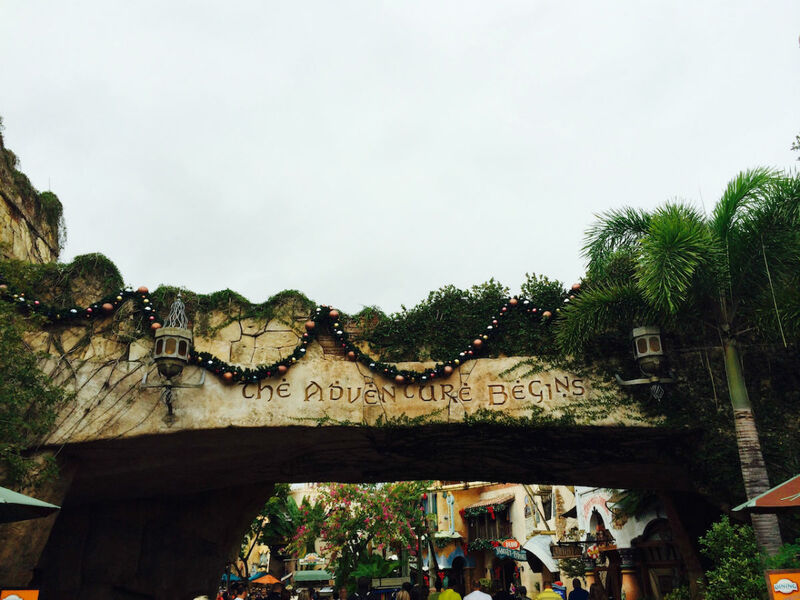 Time to head over to Islands of Adventure. Port of Entry, the best “Main Street” at any North American theme park. 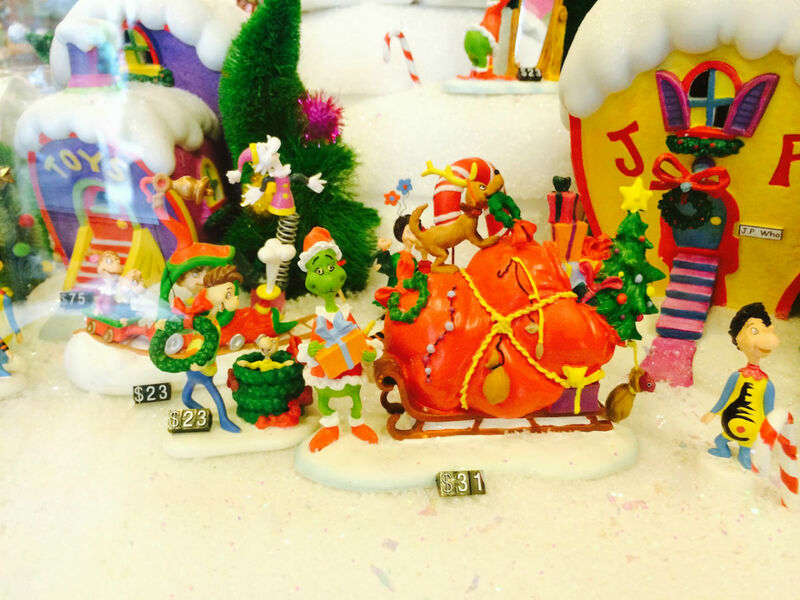 Many people don’t realize that in the Port of Entry Christmas Shoppe you can build your own “Christmas Village” collection with Grinch and Whoville themed buildings and characters. It can be pricey, but it’s definitely a cool looking set with some very unique looking figures and buildings. 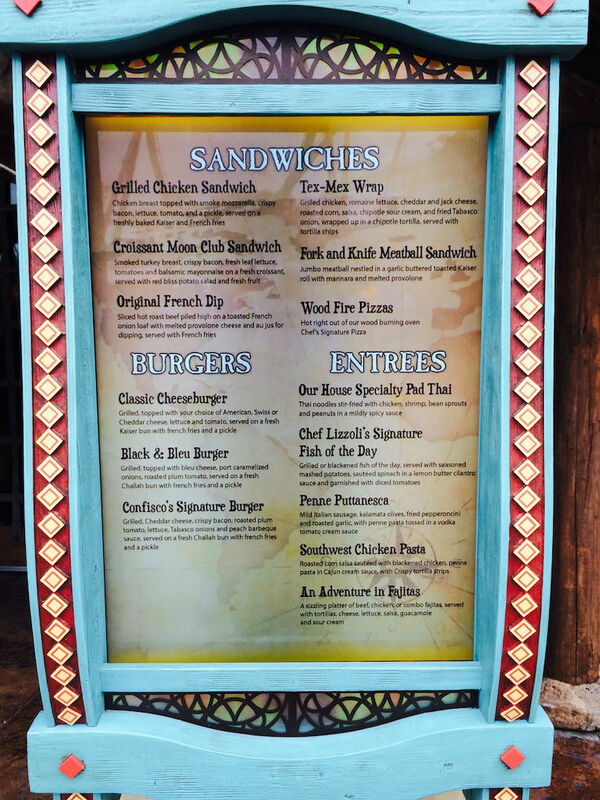 The outdoor menu at Confisco Grille has been converted to a digital display. It alternates between menu descriptions and gorgeous looking “ads” for the the food items. This is a HUGE improvement over what was there before. The new digital menu at Confisco Grille. Be sure to check out Brandon Glover’s review of the Backwater Bar, which is part of Confisco Grille. 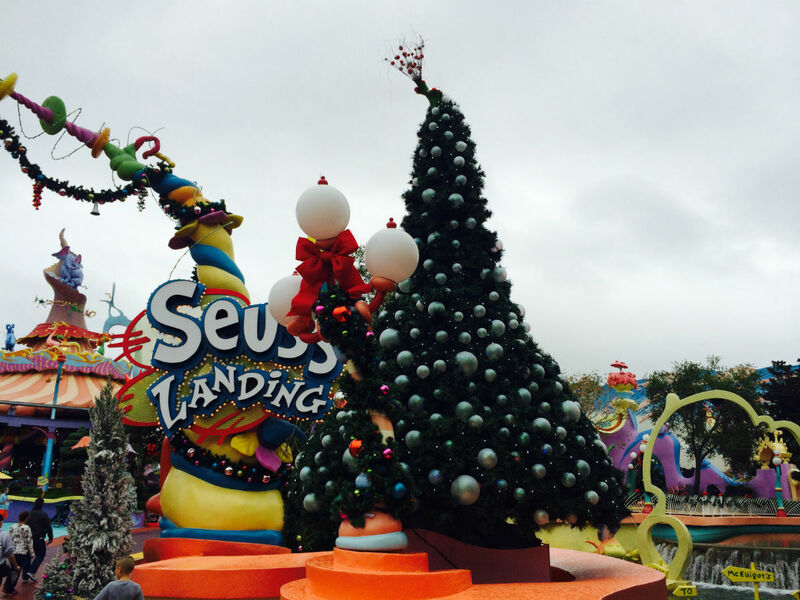 As expected, Seuss Landing is covered in Grinchmas themed decorations. These take an already sensory-overload themed area to the next level. It’s amazing. Decorations are everywhere on the island. 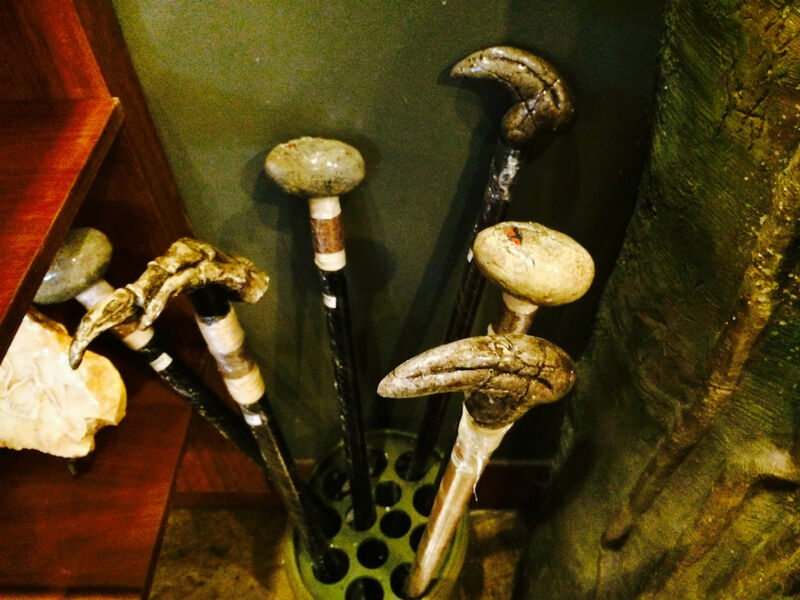 Over in Jurassic Park I noticed this walking sticks for the first time. At $49.95 they are reasonably priced for the what you get, and I can see some appeal to fans of JP. The perfect gag gift for your grandfather or Mike Scopa this Christmas. 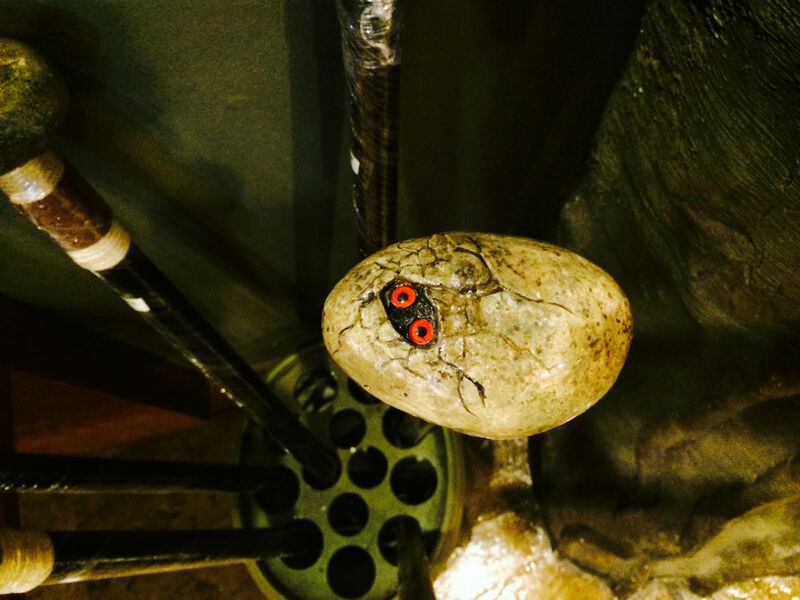 Over in Toon Lagoon, I stopped into Comic Strip Cafe and saw something pretty neat. 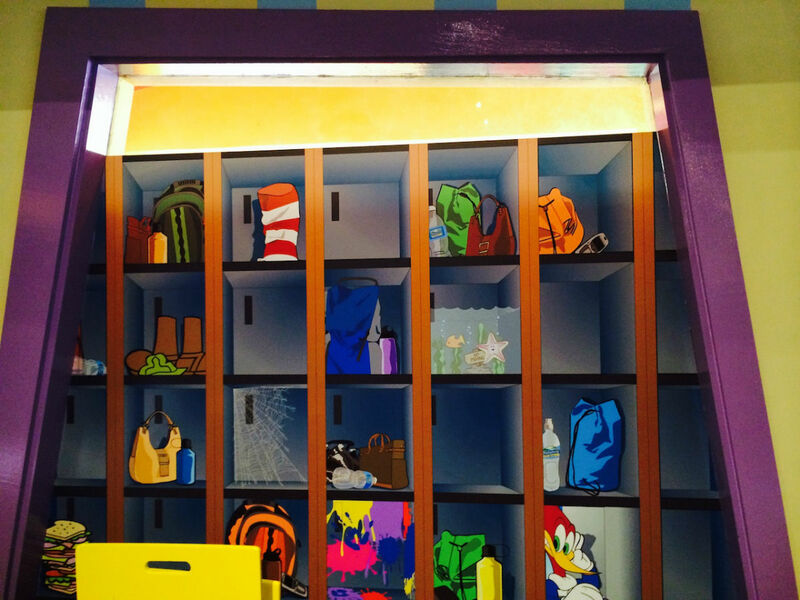 One of the walls of the restaurant borders the lockers that people use for Dudley Do-Right’s Ripsaw Falls. On the Comic Strip Cafe side they have a neat mural showing the “inside” of the lockers and have some neat references including park icon Woody Woodpecker, Beetle Bailey, The Cat in the Hat, Spider-Man, Dagwood, and the Blue Man Group. There’s even a clever nod to Finding Nemo. Over in Marvel Superhero Island, the characters were out and about, with Captain America having the biggest line I have ever seen him have. Maybe all these people have seen the awesome Winter Soldier trailer. 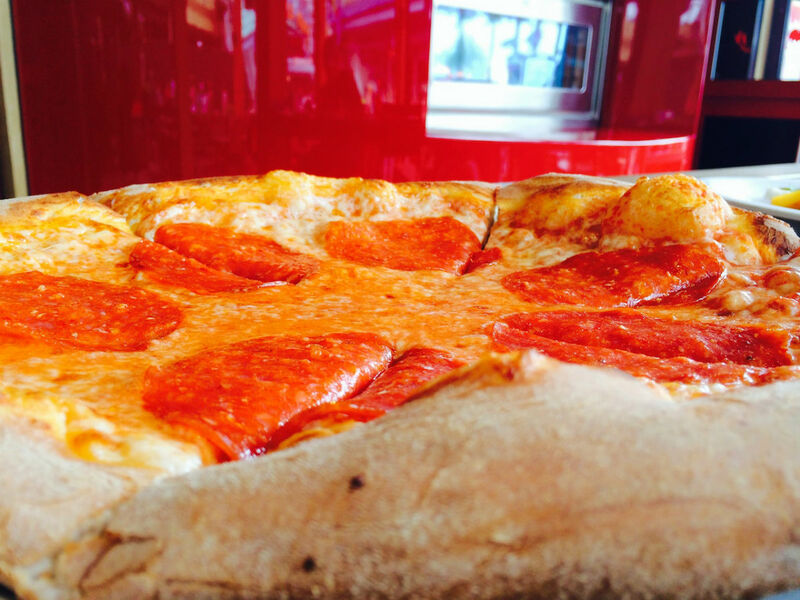 Before I left it was time to try the Red Oven Pizza Bakery in CityWalk. 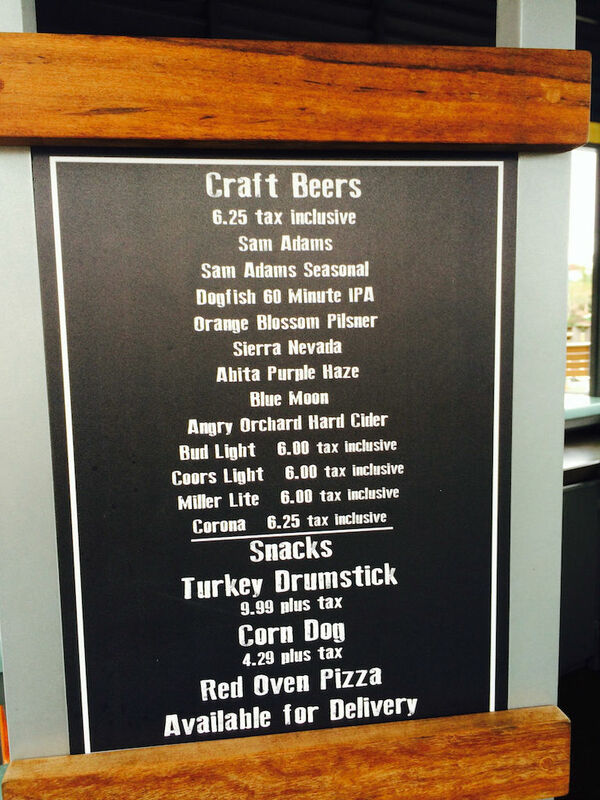 Seth Kubersky visited Red Oven on the day it opened and had very positive things to say about it. I consider myself a fan of pizza in the way many others would consider themselves fans of “breathing” or “sleeping,” so to say I’ve been looking forward to this day for a while is an understatement. I thought the inside of Red Oven was clean and sharp looking, but I’m not sure it’s the most intuitive of designs in terms of customer flow. You order at a register on the far left on the restaurant. On the right hand side are the chefs making pizzas. The menu is printed on pizza peels all along the restaurant at the top. Now, granted I’m an idiot, but I walked directly over to the register and then had to turn around to look at the menu and choose what I wanted to order. After ordering, you are given a number to put on your table so the food and drinks can be delivered. 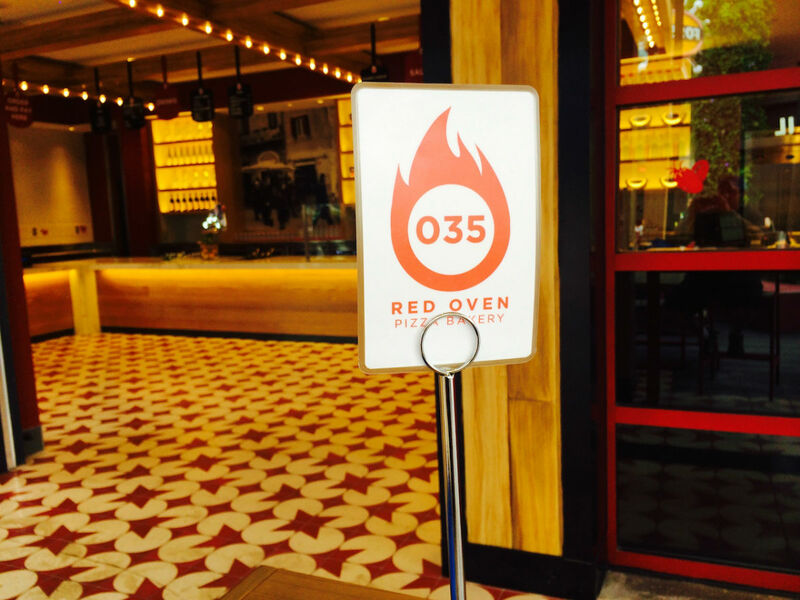 There are several tables outside, as well as a wooden bar area that faces the large Red Oven, itself. I sat in one of the bar seats. I ordered the Big Eye Pepperoni pizza (San Marzano tomatoes, mozzarella, and large pepperoni) for $13.00 and a Caprese Salad (Vine ripened tomatoes, fresh hand pulled mozzarella, organic grown Harvill Farms basil and organic first pressed extra virgin olive oil) for $11.00. This immediately became my favorite pizza on property (although Sal’s Market Deli at the Loews Portofino Bay is no slouch). 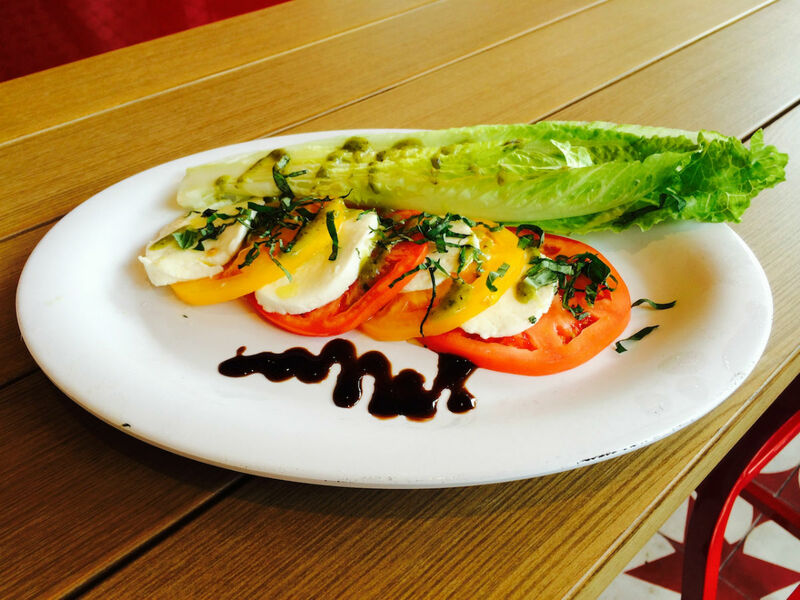 You can taste the quality of ingredients in both the pizza and salad. 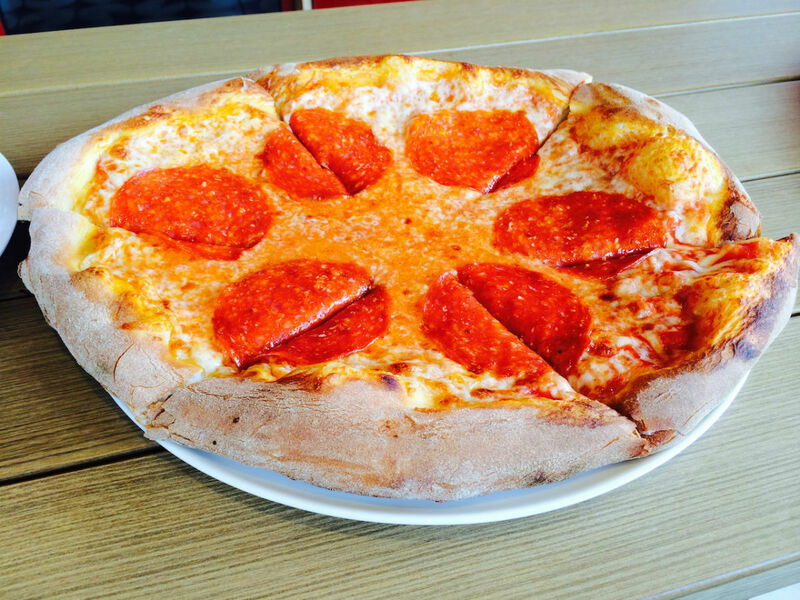 There is no place within USF or IOA that can touch this pizza, and the price is great. 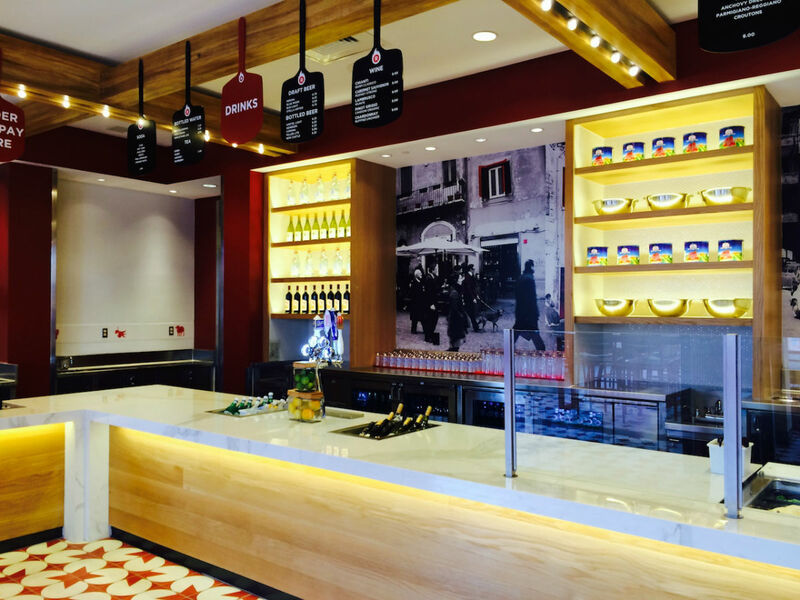 The bar areas that border the lagoon in CityWalk already offer delivery of pizza from Red Oven, and I’m hearing the Loews on-site hotels will soon offer have delivery, as well. That wraps up my day at Universal. See ya next time! I feel like I just visited the park myself. What a great job. The photos were great, and I actually can’t wait to try this pizza. The only down side is, I don’t think I’ll be able to avoid heading up there now that my wife has seen the amazing Christmas decorations. Checking Loews Royal Pacific now.